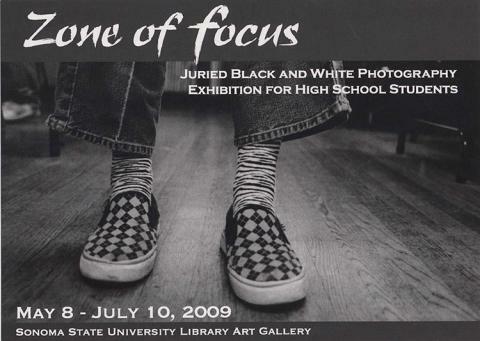 Zone of Focus is a juried photo exhibition and contest for high school students sponsored by the Santa Rosa High School photograph program, the Arts Council of Sonoma County, and the Friends of ArtQuest. Several hundred black-and-white submissions from Bay Area students were judged by a panel of prominent artists and professionals in the field of photography. The design and installation of this exhibit was done by students in the spring 2009 Museum and Gallery Methods class.